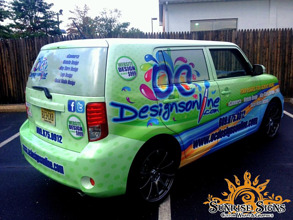 OC Designs Online Makes E-Commerce Easy With Scion xB Car Wraps in Cape May County NJ! If you think an e-commerce business like OC Designs Online gains customers via the Internet only—think again. Back in 2005, Frannie Kline started her Internet-based website/eBay store design and logo design enterprise from her home and today the company employs six designers and four programmers and is expanding at a rapid pace. That’s quite an achievement for this website design / e-commerce website design business located in Cape May County in Ocean City New Jersey. Sunrise Signs helped Frannie to gain more off-line visual impressions with some unique and noticeable Scion xB car wraps.